Thank you to the lovely and talented Jean Cogdell for my nomination for the Lovely Blog Award this past weekend. I’m honored she enjoys my blog post and encourages me to participate in writing prompts and all the fun on her blog. If you’re a writer, she has great tips and lots of fun on her page. This award comes with instruction that I am to tell you 7 facts about myself. 1. I was a director in 4th grade for our school play Hansel and Gretel. This began my career of telling others what to do. 2. I had a pet tarantula named Creepy Crawler – “Creepy” for short. He was found on a dirt road in Oklahoma, where my Dad rescued him in a paper bag and had me ride with him in the back of the truck. My fear for spiders haven’t changed much but Creepy was cool. 3. I had a mullet hairstyle in middle school, but I swear I rocked it and it was super cute! Business in the front, party in the back. 4. I pretended I was lost boy when I was 6 years old on the Peter Pan boat/ride at Disney Land so that I wouldn’t have to leave, Peter Pan helped me find my parents, which originally I denied I knew where they were. This started my love of rogue ‘bad’ boys. 5. I swam with sharks at Disney World, it was exciting but scary all at the same time. My daughters where yelling the entire time, “Don’t Die!” so I guess it worked out for both of us. 6. I love cheese, all kinds, even the stinky ones. Pair it with a good wine and cracker, I’m in heaven. I’ve never met a cheese I didn’t appreciate. 7. I still have VCR tapes in a box (for those who don’t know, VCR tapes are like DVDs of today but way older/bigger and with actual film, just kidding its tape). Why I retain these I have no idea, I do hold onto the past from time to time. 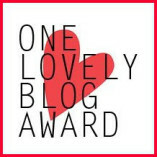 Lastly the final requirement, I bestow the ‘Lovely Blog’ award on some new sites I am enjoying via the links below. Take a moment and check out the above blogs along with Jean’s. Great facts, thanks for sharing 🙂 At one time I would have shuddered at the prospect of having a tarantula as a pet (I’m scared of spiders), but recently I held one in my hands and, for the first time, appreciated their beauty. Tarantula’s are really neat. I didn’t ‘play’ with it to much as a kid but certainly held Creepy from time to time. My Dad was really fascinated with him. We had him for over 2 years if I remember correctly. Sounds like a fun childhood. Your post made me smile.